Definition: A Ring Modulator is a device which takes an input waveform and modulates it with a sine wave oscillator to produce a sum and a difference signal which is remixed with the original input signal. Frequency: Controls internal sine wave generator frequency. Normal: Controls amount of unmodified input signal or return volume of the effect loop (if used). Effect: Controls amount of sum and difference signal appearing in the mix. Footswitch: Gives a true by-pass of the entire effect when this switch is engaged to preserve integrity of signal when effect is cancelled. Back Panel Features from Left. Input: Accepts 1/4" input from guitar or other signal source. Output: Accepts 1/4" jack to convey output signal to amp or subsequent effect stages. Loop: Uses send and return cord to patch another effect into the normal signal path just before the output mixing stage. C.V.: Uses 1/4" stereo cord to patch conventional volume or expression pedal to Ring Modulator so sine frequency can be remotely controlled. Please note: This requires a "stereo" or two-way patch with a distinct "send" and "return" line for the control voltage. 5 volts out is "tip" and return is "ring". We frequently use our korg exp-2 or an RFX .402-p vol /pan/cv pedal. 12VAC: 2.l-mm barrell connector, hooks 12vac to power-up the effect. 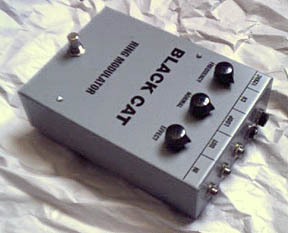 To use the Black Cat Ring Modulator, first plug instrument into the input jack and another cord into the output to either go to an amplifier or another type of effect. Plug the black wall transformer into the receptacle and into the wall socket. Play a few notes with the normal control turned at least 3/4 of the way up and the effect control turned all the way down. Now turn up the effect volume and hear the sum and difference signals mixed with the unaltered input signal. By sweeping the frequency to the right, the internal sine wave oscillator increases frequency giving a more dramatic effect. To cancel the effect actuate the by-pass footswitch to hear normal instrument volume. The Black Cat Ring Modulator gives the best results by keeping the normal volume between 1/2 and 3/4 and the effect volume at full. To give a more interesting and varied effect, a standard expression or volume pedal may be patched to the cv jack thus moving control of the internal sine wave from the frequency knob to the pedal. Rocking the pedal back and forth while playing gives an interesting sound completely different from what you have been hearing. See cv jack description for pedal specifications. Note: A slight amount of the internal modulating signal will be audible when you are not playing. This is normal for a ring modulator and this unit features special regulated offset circuits to keep this to a minimum. By patching a standard send and return cord into the loop jack, you can send the unaltered guitar signal and process it through another effect in parallel and then return it to the mixing stage. Effects with input and output level controls work best in this loop. Please note that the normal control will change the loop return level when the loop is engaged. For proper operation connect tip to the input and ring to the output. If your Black Cat Ring Modulator should start getting excessive carrier bleedthrough you can solve the problem easily. First turn the unit over and remove the four screws. Please save these for reassembly. Place the box with the patch bay of jacks facing away. Then locate the two blue potentiometers on the right. Gently lift the circuit board from the mounting posts and use a very small flathead screwdriver to adjust the pot that is farthest from you. First turn right and listen for the noise to decrease as you turn the pot. If it increases turn the pot the other way until the noise is barely audible. All parts with the exception of transformers, potentiometers and mechanical switches are guaranteed for two full years from date of purchase. This does not apply to damage caused by misuse of the device or willful destruction.